Take advantage of the new water flossing technology to enjoy clean, fresh, and healthy teeth. The oral irrigator allows you to customize your flossing with three pulse modes of normal, soft, and pulse. Soft mode is effective for those who have sensitive mouths. You can use your oral irrigator with confidence when in the shower thanks to its IPX6 waterproof design. The Lavany Portable Oral Irrigator boasts a detachable water reservoir of 200 ml that lasts up to 45 seconds. Avoid the hassle of having to frequently refill the water while flossing. Every time you do wish to floss, just open the lid, add water or mouthwash through the inlet, and turn on the switch. 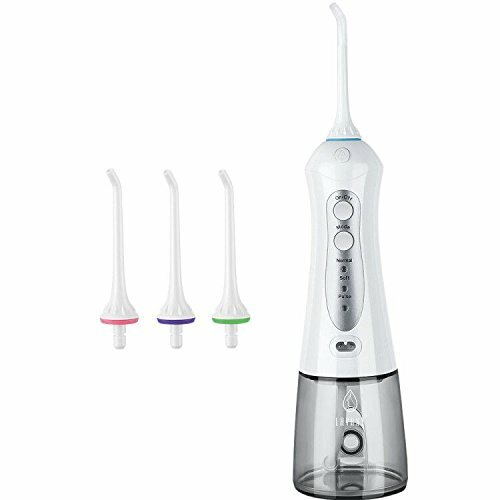 Comes with 4 standard nozzles with pink, blue, and green color rings to distinguish among them; suitable for the whole family to use and your family will enjoy the best oral health together. The Lavany Portable Oral Irrigator is only 20cm long and comes with carrying bag, so you can take care of your dental care needs wherever you go. Just pack it with you on your travels and you can floss whenever you need. If you have any questions about this product by Lavany, contact us by completing and submitting the form below. If you are looking for a specif part number, please include it with your message.